At the foot of Niuling Mountain in the southeast of Hainan island, lies a mysterious valley that is a palace of plants - from lowly weeds to the nobility of flowers. 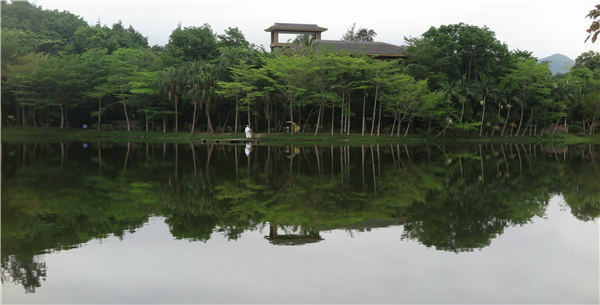 Named Xinglong Tropical Garden, located a little bit north of the northern altitude of 18 degrees, the garden is home to more than 1 million trees belonging to 4,500 tropical species. Famed as a natural oxygen bar, it boasts more than 65 kinds of rare plants that are on the endangered list, such as Shorea roxb, Hainan palm, Dracaena cochinchinensis, Vatica astrotricha, and Dalbergia odorifera, all collected from other places, both in China and overseas. The garden is the fruit of 26 years of painstaking toil and scientific exploration by Zheng Wentai. Standing in the center of his huge tropical rainforest garden that radiate around for more than 800 hectares, one cannot help but be overcome with emotion by the amazing power arising from a deep rooted dream, courage and persistence. 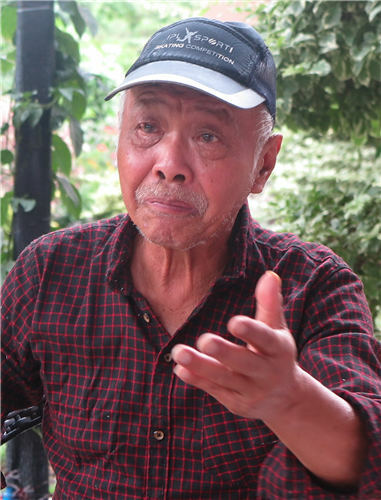 "My friends said I was crazy, throwing large sums of money into a piece of unprofitable wasteland, and my parents even threatened to break off relations with me when I decided to launch my long-cherished plan to rehabilitate the forest in Xinglong in 1992," recalled Zheng, who is wearing a plaid shirt, a pair of blue jeans and Chinese slippers, his standard wear when working in his garden. And although 73 and thin, he remains incredibly fit. Born in Indonesia in 1945, Zheng studied for four years at a middle school in Beijing and went to Xinglong in 1964, at the age of 19. He spent half his waking hours working and the other half studying at the Xinglong Overseas Chinese University, when he majored in tropical crops and plants. It was there Zheng developed his love for rainforests. However, following the advice of his parents, he started his career in the early 1980s as a real estate developer after completing a university degree in architecture and design in the United Kingdom. And he made a handsome fortune in real estate. Such that in 1992, at the age of 47, Zheng was able to say goodbye to his life as a successful realty boss and start his new life as a gardener, commencing to create the green world he had dreamed of . "Traveling around China and overseas, I noticed the lack of environmental protection in the rush for economic development. And my heart ached during a visit to Xinglong, when I saw the once lush green land had become a barren Siberia after years of over-felling the trees," Zheng said, still sounding distressed at the memory. "A serious illness in 1991 made me realize that life is short, and I must do something my heart really yearned for," Zheng continued, speaking standard Mandarin with a typical Beijing accent. "Rainforests around the world are shrinking. So we must hurry up to save them before many species become lost," Zheng said, adding it was a difficult decision as it meant starting from scratch and required a huge amount of money. But he decided to go ahead, selling his properties in Guangzhou, Hong Kong and Singapore for 100 million yuan ($15.58 million) and cooperating with the Xinglong Overseas Chinese Farm with the aim of building a brand new garden and a gene bank of tropical species for the nation. More than 20 tropical plant experts were invited to be a think tank and a detailed long-term plan was drawn up. About 1,000 local workers were hired to help improve the soil and cultivate the seedlings of rare and endangered plants, some of which Zheng collected himself from overseas. In his heart there is a list of rare plants that he is searching for. Whenever he learns about a certain rainforest plant, he will go see for himself without caring about the cost. He was once rushed to hospital by friends after he fell from a cliff when searching for a cycad. The lucky thing was that he found the rare plant and has reproduced quite a number of them in his garden. "We have tried hard to breed white Gironniera subaequalis, once a top-tier plant in Hainan's tropical rainforest, but so far little progress has been made. Maybe its associated species are no longer existing," said Zheng. But a number of endangered plants are doing well having received good protection. Now Zheng has started the second stage of his rainforest rehabilitation growing epiphyte plants, such as mosses and orchids, a special yet indispensible part of tropical rainforests that boasts of 30,000 varieties around the world. They grow on tree trunks and survive by absorbing rain, vapor and rotten materials on the trees. "We have grown large areas of epiphyte plants, including various orchids, on the trees and rocks. Dendrobium is a beautiful epiphyte plant that flowers and also a precious plant for traditional Chinese medicine, that we are widely planting on trees in the garden. We are making the best use of every inch of the land by creating spatial gardens on the trees. They help build a richer ecological structure and create some added economic benefits for the garden as well," said Zheng. To protect their growth, he has temporarily closed the garden, which has become a popular four-star tourists site. "I will reopen the garden to let people enjoy it at a proper time," said Zheng, sitting in his garden coffee bar, which is charmingly decorated with more than 200 kinds of blossoming orchids. Some realty developers covet Zheng's garden and ask for a piece of land for housing projects inside. He refuses pointblank, although that would bring him a huge sum of money. "I'm considering how to share with the local people the scientific research achievements my team has made in farm produce processing and developing new varieties of economic corps such as coffee, pineapple and lichi and tuberous crops," said Zheng. Being an epicure himself, he has developed a number of delicious foods from local crops that people rarely ate before. Every inch of earth in the garden gets good care from Zheng, said Xiao Wang, a worker at the garden. For example, he said, one day Zheng stopped a visitor who was digging for earthworms to use as bait for fishing. Another day, he declined a visitor who tried to pick fruits from a waxapple tree, saying, "They are not for you, they are grown for the birds in the garden." Zheng said his progress was still in its initial stages as "it takes at least 400 years to produce a sound system of tropical rainforest." "It is now too early to judge what I have done. Compared with what I have spent, the garden is a much greater reward," said Zheng.